Our advisory group has developed an agenda. From Sunday evening, July 6, through Tuesday, July 8 we will meet, get to know a little about Whitehorse and the Yukon, and begin our explorations of wild pedagogies. The proposed venue is right on the Yukon River’s bank and is an ideal place for outside workshops and discussions. Guest speakers will add local context and insights. Much of July 9th will be devoted to preparing for the canoe trip. Participants will be divided into groups who will, with group leaders, plan, purchase and pack trip food, and sort out tent groups. We will also have a trip briefing. July 10 -16 will be on a section of the Yukon River. The trip will involve paddling and talking in 3 or 4 groups that will rendezvous each evening at selected campsites. We will arrive in Dawson City in the afternoon of July 16th. This vibrant little city, made famous by the Klondike Gold Rush, bustles in the midnight sun of summertime. It also has a rich arts community. 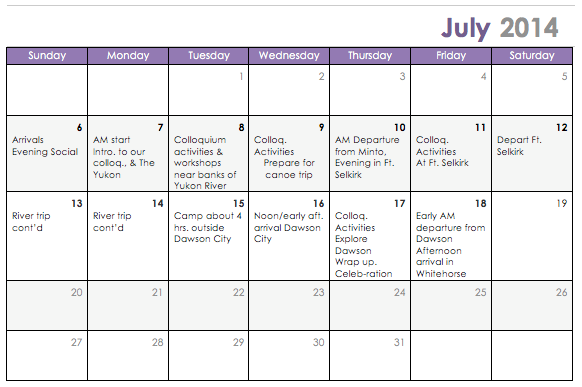 There will be time to both explore Dawson City and wrap up our colloquium activities on July 17th. July 18 is a travel day for returning to Whitehorse (approximately 6 hours).